In community-type content such as blogs and SNSs, we call the user’s unawareness of information as a ”content hole” and the search for this information as a ”content hole search.” A content hole search differs from similarity searching and has a variety of types. 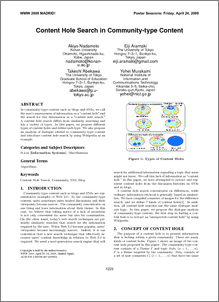 In this paper, we propose different types of content holes and deﬁne each type. We also propose an analysis of dialogue related to community-type content and introduce content hole search by using Wikipedia as an example.